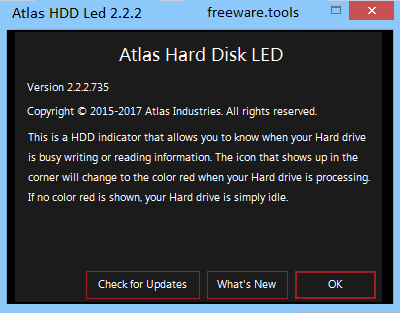 Atlas Hard Drive Led is a very simple program that allows you to know if your hard drive is busy reading [and/or] writing. The notify icon will change to the color red when your Hard drive is processing. If no color red is shown, your Hard drive is simply idle. While several years ago, all computers came with some form of indicator for the hard disk's activity, the feature has been considered obsolete and consequentially removed. Then again, the function still comes in handy in many situations, particularly when you want to determine whether your PC's non-responsiveness is a something serious or just a delay. Atlas HDD Led is a small piece of software designed to act as a hard disk activity indicator so that you have an alert about potentially more critical problems. The setup is a quick and straightforward process that entails decompressing the archive in any desired location of your HDD. Since the application does not include an interface, you should bear in mind that you can access it from the System Tray. You should keep in mind that the app solely presents an alert about the monitoring of your volumes at first launch only. Therefore, in case you want to access it, you can simply check the icons of the tools opened in the System Tray dedicated panel. Granted, the app is developed with a sole purpose in mind, namely to bleep whenever the hard disk is busy reading or writing something. Moreover, considering that modern computers can have solid state drives installed as well, it would have been useful if the program could let you preview the S.M.A.R.T. attributes as well. More precisely, it would be nice if it allowed you to view the current, worst and threshold values of each indicator. All in all, if you are looking for a basic application that allows you to determine the cause of your HDDs non-responsiveness, then Atlas HDD Led could lend you a hand.